We have tried Erie Brewing Company's beers before and have never been too impressed. Railbender Ale is okay and Misery Bay IPA is decent. There is nothing original nor anything special that makes you want to pick up another six pack of their brews. At U-Pick-6 in Erie PA, Mike noticed a beer in their fridge that he had never seen before- Ol' Red. It looked interesting and carries a nice punch at 10.1% ABV. Could this beer save our perceptions of EBC? Ever have first impressions that stuck? This beer is one of them. It has a good beginning with a nice malt taste, much unlike most red or wee ales. Everything goes down hill from there- it completely lacks in body. This beer is like "It" from the Addams Family. The alcohol does not seem to be too prevalent given the ABV but there doesn't seem to be any redeeming factors to it. Erie Brewing Company- how you have let us down. Our three closest bottling brewers besides you, Great Lakes, Southern Tier & Thirsty Dog (sorry Buckeye Brewing, you don't quite have distribution to make the list) have put you to shame. They should Cease & Desist from creating beer. Keep with the brew pub for a while and let us know when you come up with something better. 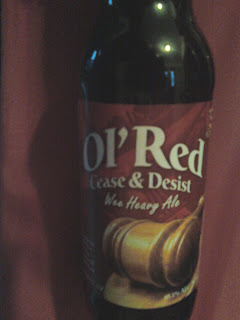 This beer should have been called Ol' Yeller instad of Ol' Red.